Concrete Truck Mixveyor | Mixveyor Concrete Conveyor - Value Tech Ltd.
Value Tech offer a range of truck and transit mixers mounted telescopic conveyor belt (tele-belt) inclusive complete integrated electro hydraulic radio control system. This equipment is constructed from top quality high tensile steels giving maximum strength, and increased payload to yield maximum return on investment for the customer. The innovative VTM 110 T tele-belt which in the transport position has very low centre of gravity is designed to ensure maximum operator safety and efficiency while inflicting minimum wear and tear on the equipment. 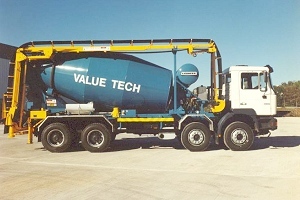 The Value Tech truck mixer telescopic conveyor system provide ready mix concrete companies or their subcontractors with a convenient and cost effective solution to concrete delivery and site placement requirements. Truck mixer turnaround time can often be reduced while increased revenue can be achieved by accurately placing the concrete for the customer. 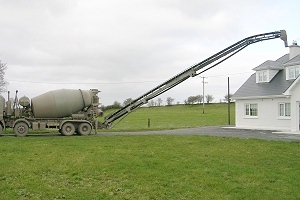 The concrete can be poured up to 16.5 meters from the truck, to a height of up to 8 meters and a depth of 2 meters. Linear telescopic movement allows for a 24 meter length of wall pour without moving the truck while the conveyor also rotates through a 270 degree envelope about the rear centre line of truck mixer to ensure accessibility to large area for concrete placement. Robust construction to ensure longevity of life with minimum maintenance and repair. Accurate, safe and cost effective solution for small to medium concrete pours using operator friendly completely integrated radio control operating system. Installed in a manner that gives very low centre of gravity which improves safety, enhances stability which is very important for good road dynamics and handling. Fully integrated rotating delivery chute to increase outreach and reduce in reach while also allowing the operator pour concrete around obstacles. 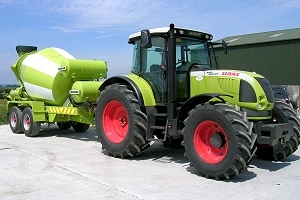 Unique lowering system on feed hopper to allow for the deliver of dry slump concrete or aggregate while also providing for the possibility for concrete to be delivered effectively from another truck mixer. The Mixveyor is a specially constructed truck mixer body inclusive low level telescopic belt conveyor with optional rotating delivery chute. The mixing drum is designed to consume minimum power from truck engine and provide maximum stability with low centre of gravity for optimum road performance. The drum is constructed from special wear resistance steel that requires lighter sections without compromising durability or longevity of life while the integrated telescopic belt conveyor is constructed from special high strength tubular high tensile steel profiles with maximum strength to weight ratio. All electrical and hydraulic systems are integrated and fully assembled on modular sub frame for easy installation and connection by customer / dealer on most conventional chassis cab truck. 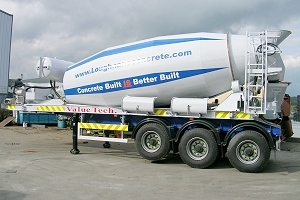 Maximum payload capability for concrete delivery placement equipment. Easily and quickly installed onto most conventional construction type chassis cab units. Fully integrated radio control operating system with manual over ride in emergency. All major components manufactured by reputable German manufacturers e.g. Sauer Danfoss. Bosch Rexroth.